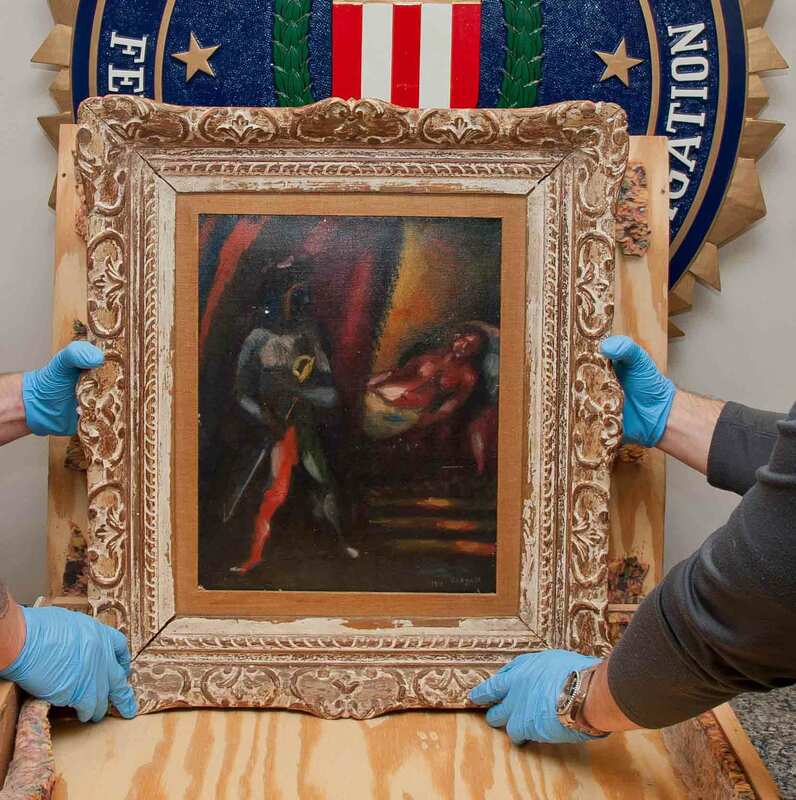 Personnel from the FBI’s Art Crime Team hold a framed work by Marc Chagall prior to its return to the owners’ estate nearly 30 years after it was stolen. Nearly 30 years after an elderly New York couple’s 1911 painting by Marc Chagall was stolen from their Manhattan home, the modernist oil-on-canvas work is being returned to the family’s estate. The painting, entitled Othello and Desdemona, was recovered last year after a Maryland man contacted the FBI’s Washington Field Office. The man’s repeated efforts to consign the painting had been rebuffed by a Washington, D.C., gallery owner who was suspicious about the lack of paperwork supporting the painting’s authenticity and provenance. The gallery owner suggested the man call law enforcement, which is how it became an FBI investigation. Marc Chagall painted Othello and Desdemona in 1911, when the Belarusian artist lived in Paris. 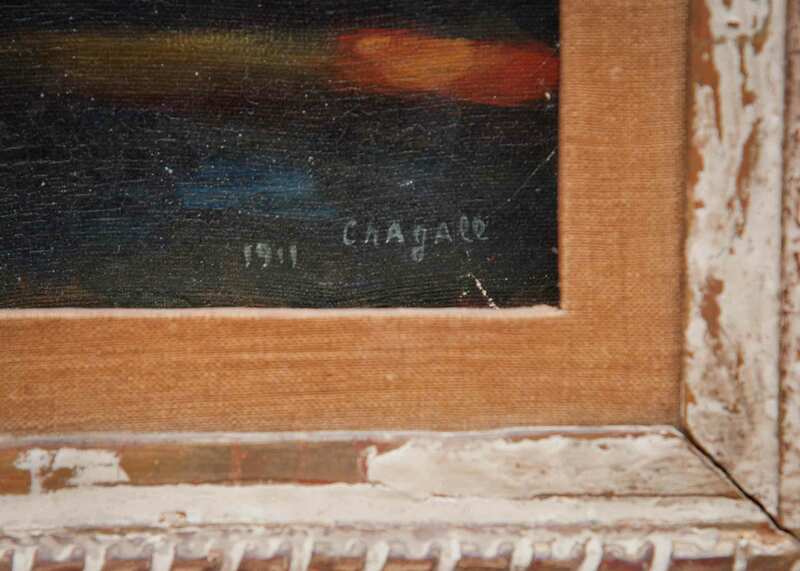 A label on the back of the Chagall painting shows it was exhibited at the Kunsthaus Zurich in Switzerland. According to court documents, the Maryland man had obtained the painting in the late 1980s or early 1990s from the man who stole the Chagall in New York in 1988. The thief, it turned out, was a worker in the Upper East Side building where Ernest and Rose Heller lived in an apartment surrounded by paintings and sculptures by renowned artists like Renoir, Picasso, Hopper, and Chagall. Several other works of art also disappeared in the heist. Shortly afterward, the thief met with the Maryland man in Virginia to try to sell the painting, court documents show. The Maryland man found a potential buyer, but the deal collapsed when he learned he wasn’t going to receive a cut of the proceeds. The Maryland man kept possession of the painting and stashed it in his attic for years. He brought it out in 2011—and again in January 2017—in his fruitless appeals to the D.C. gallery owner to exhibit and try to sell the stolen art. The Hellers, who bought the painting in the 1920s, have both passed away. 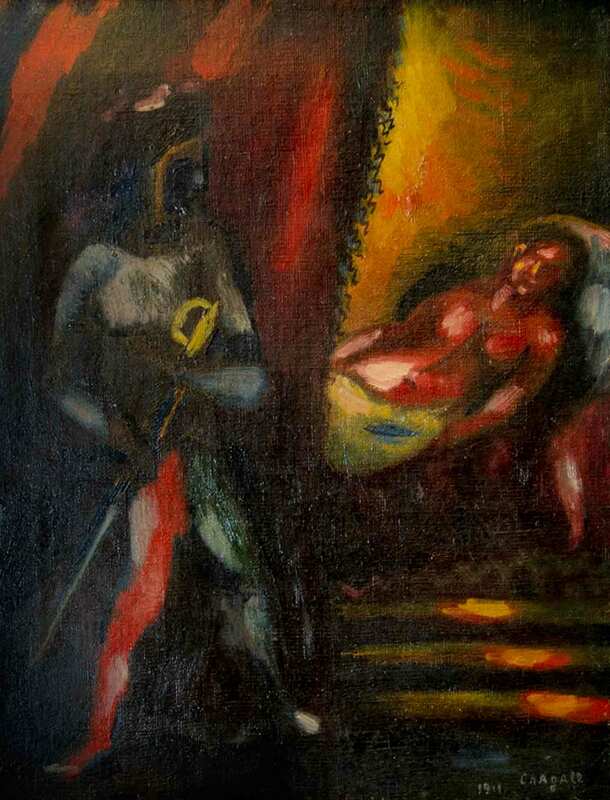 The artwork, which shows Shakespeare’s titular Othello holding a sword and looking at his bride, Desdemona, lying on a bed, was painted by Chagall when the Belarusian painter lived in Paris. In 1967, the Hellers’ painting was on exhibit at the Kunsthaus Zurich in Geneva, Switzerland. The statute of limitations for the theft has expired, so no charges are pending against the individual who initially stole the painting, nor the individual who kept it. The Maryland man is not named in court filings. The suspected thief in the case was convicted in federal court and served time on charges related to selling stolen property, including art from other apartment buildings. “The investigation into the other missing paintings continues,” Hess said. The Chagall painting, which until recently was still stored in the makeshift wooden box, will be returned to the Hellers’ estate, which plans to place it on auction. Proceeds will reimburse the insurance company that paid the theft claim years ago and be directed to several non-profit organizations supported by the estate, including an artists’ colony in New Hampshire. 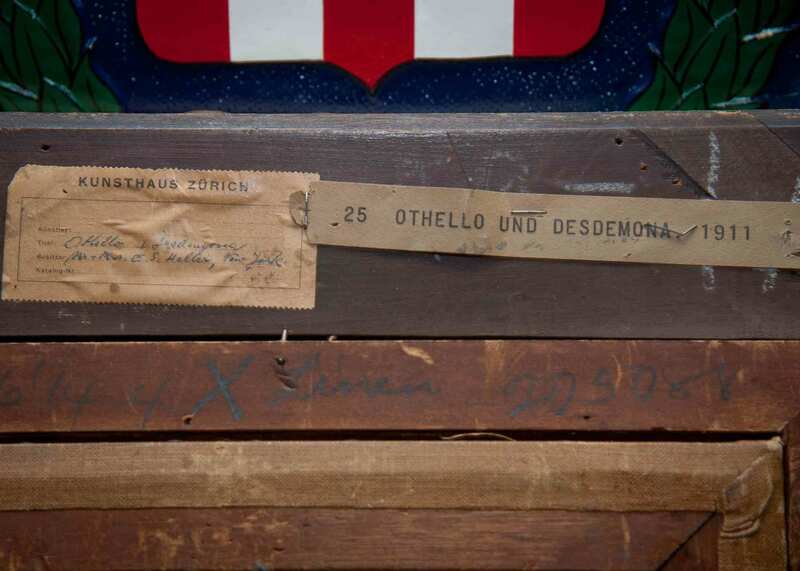 The painting, Othello and Desdemona, was recovered by the FBI in 2017, nearly 30 years after it was stolen in New York City in 1988. During National Crime Victims’ Rights Week—and every day—the FBI’s victim specialists work to support federal crime victims and their families during some of the most difficult times in their lives.